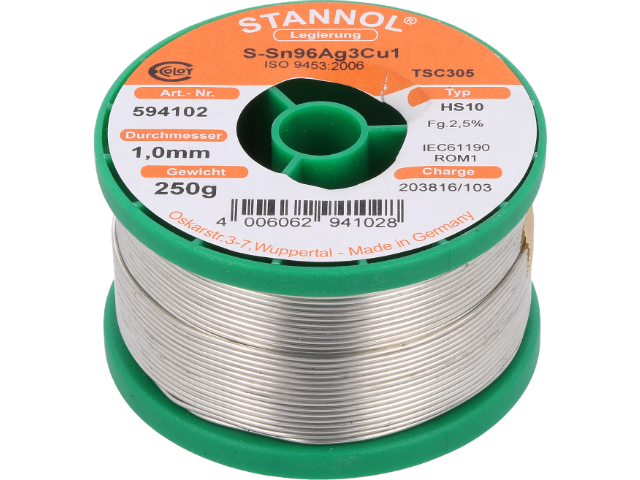 TME’s offer has been enriched by a whole range of solders from STANNOL, a German brand. Available wire diameters are: 0.23mm, 0.3mm, 0.5mm, 0.7mm, 0.8mm, 1mm, 1.2mm, 1.5mm, 2mm, 3mm, with reel weights of: 100g, 250g, 500g, 1000g. The majority of STANNOL solders come in several versions, with different flux, number of flux cores, and flux percentage. It enables a perfect fit of the alloy used to the production and service soldering works at hand. We encourage you to check the full offer of solders from STANNOL available at TME.